In general, food is pretty much universally my favorite topic to talk about. When Jane started to show interest in solid foods I was so excited, because it means we get to talk about food even more than usual. With that big transition came lots of research and questions and frantic Googling (can babies eat greek yogurt?! ), so I thought it would be helpful to share a little bit about our experience with Jane and food for others going through the same thing. 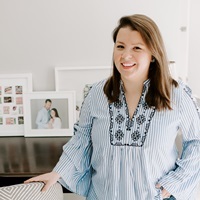 We have found some products we swear by, and a few favorite foods that helped Jane make the solid food transition jump pretty seamlessly. Jane led the way with interest in grown-up foods. At 4 months old she was pretty intently watching us eat dinner, and attempting to grab bites of whatever we were eating off of our plates. In fact, I think her first really bite of food was Naan from our Indian take out order – she gummed the delicious flatbread for twenty minutes and was in heaven. I think that first taste got her hooked and she now is frantically trying to taste-test any food that she sees an adult eating (a good problem to have until she tries to grab a spicy chicken wing off my plate). Since she showed interest pretty early on, we used a Bumbo seat to sit her up next to us while we were eating meals, and tried to feed her pureed food as we were also eating. The seat was great to keep her propped up and contained before she was big enough to transition to a full high chair. 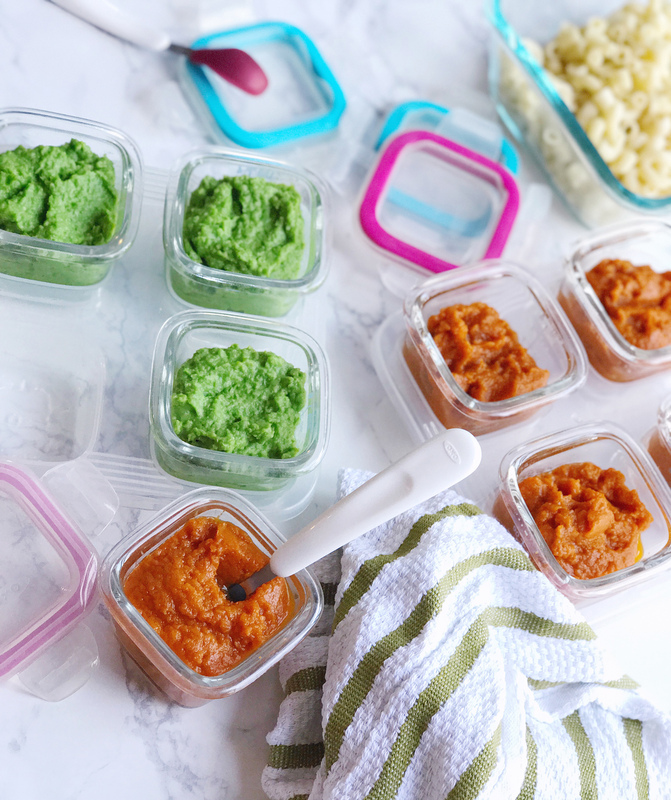 We tested a few jarred baby food brands, but quickly realized that it was expensive and creating a ton of waste. Since we’re pretty good about meal-prepping for ourselves on weekends, we decided to try our hand at making our own. I grabbed a few books about baby puree recipes and hit the store for some fresh fruits and veggies. I know it sounds like a ton of work, but it takes me about 30 minutes on Sundays to make a week’s worth of food for about $4 in total. To me, that’s totally worth it. We use our Instant Pot to steam veggies and some fruits, and then use a blender to puree them to a Jane-safe consistency. Some of the fruits just go into the blender raw and make it even easier. 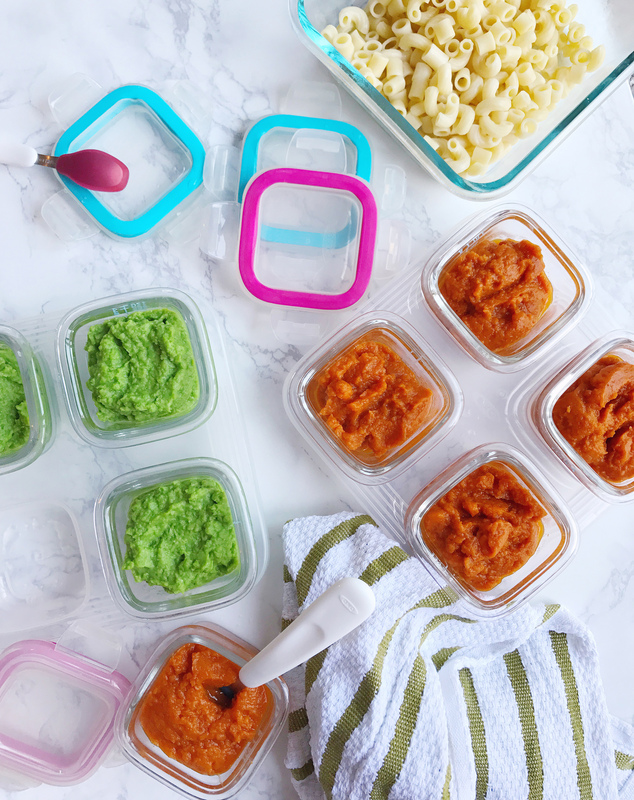 We have a few sets of glass OXO baby food storage containers that make portioning out the food simple, and I love how they come with little trays to contain them inside your fridge (organization nerd here!). As Jane grew out of the Bumbo seat, we did tons of research on high chairs before we pulled the trigger on one. My biggest concern, after safety of course, was that it wasn’t going to be a giant eyesore in our kitchen. Ease of cleaning was also a high-priority, as was being able to transition with her as she got bigger — and I read tons of review to find the right one for us. 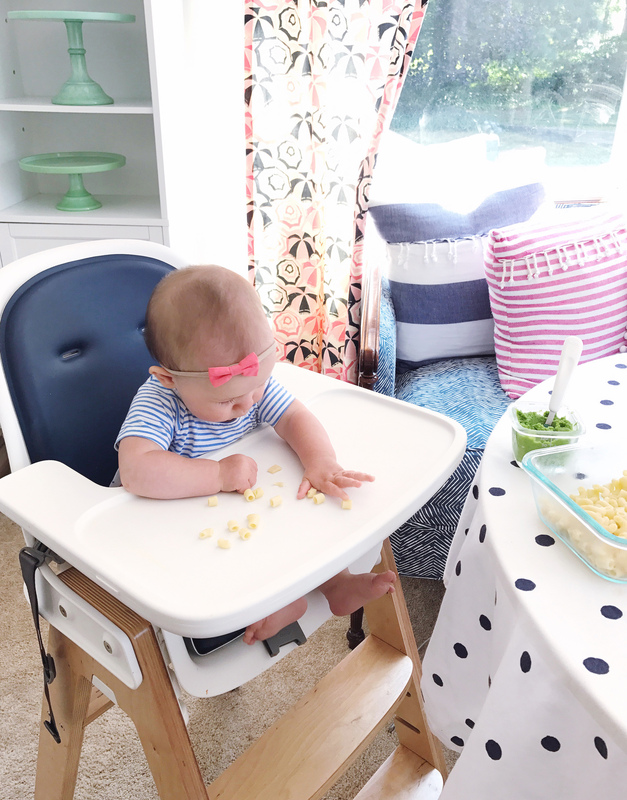 We landed on the OXO Tot Sprout high chair, and I really can’t say enough good things about it. I love the design of the high chair, with the wood base and white seat – it’s modern, sleek, and feels well-made. It also has a removable seat pad that pops out for cleaning (so helpful), and the tray also cleans up quite easily too. 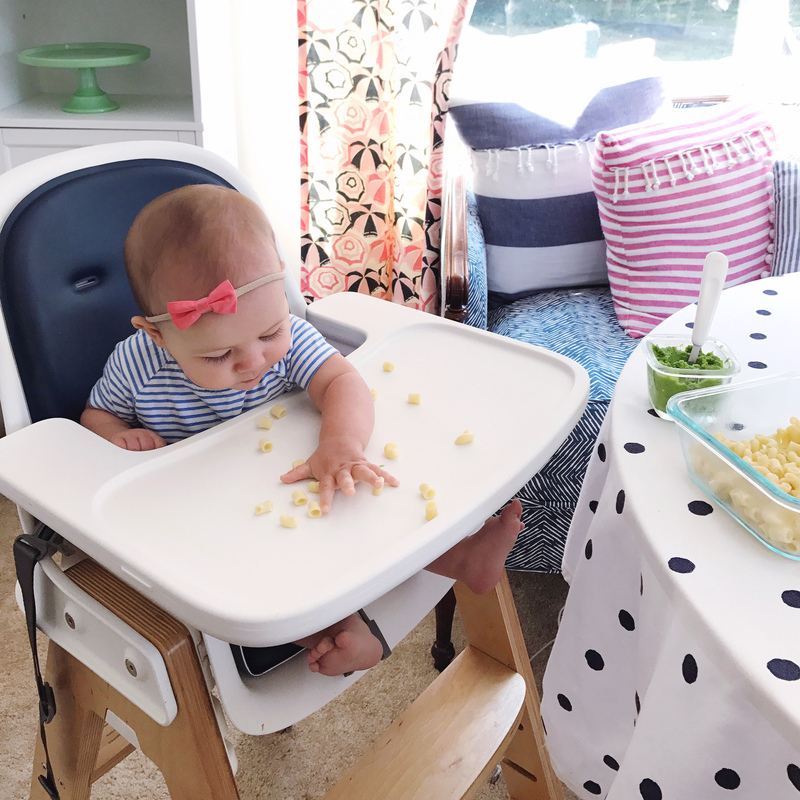 Now that Jane is snacking on a few starter fingerfoods in addition to the purees, she loves sitting in it and plucking little bites off the high chair tray. Jane is obsessed with being able to eat finger foods on her own, so to start her off we gave her some teething crackers and puff bites. After some practice she’s already moved on to small bits of pasta and some chopped up fruits. We joke that she’ll be unstoppable once she gets teeth! 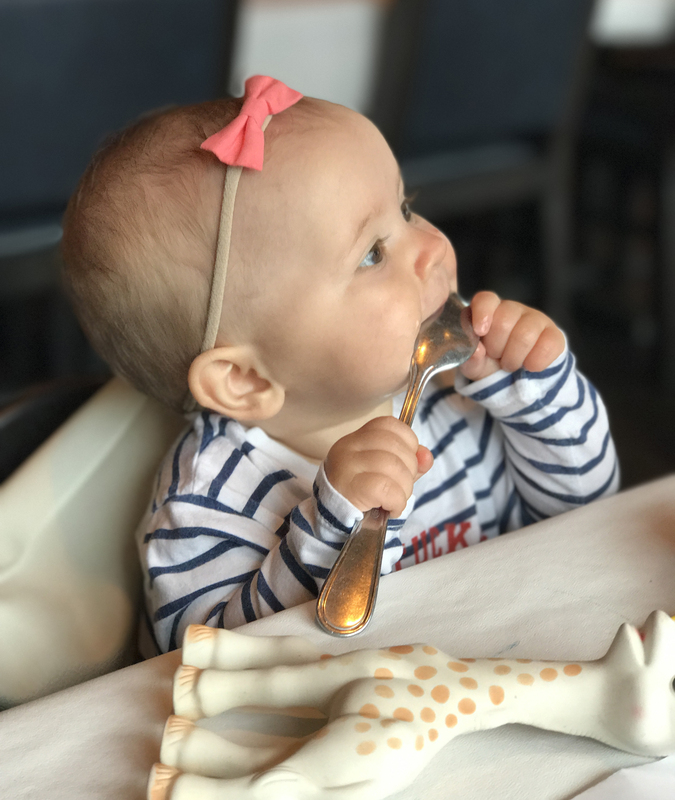 A few of the other products we’ve been relying on since she started the solid food transition are some great OXO baby spoons – I like that these come with an optional travel case so they’re great for tossing in the diaper bag when we visit family. We’ve stuck to simple cloth bibs that can be run through the wash after each use, and have an adorable SkipHop travel bib that I keep in my purse for on-the-go snacks (it folds up into an attached pocket and is teeny-tiny!). 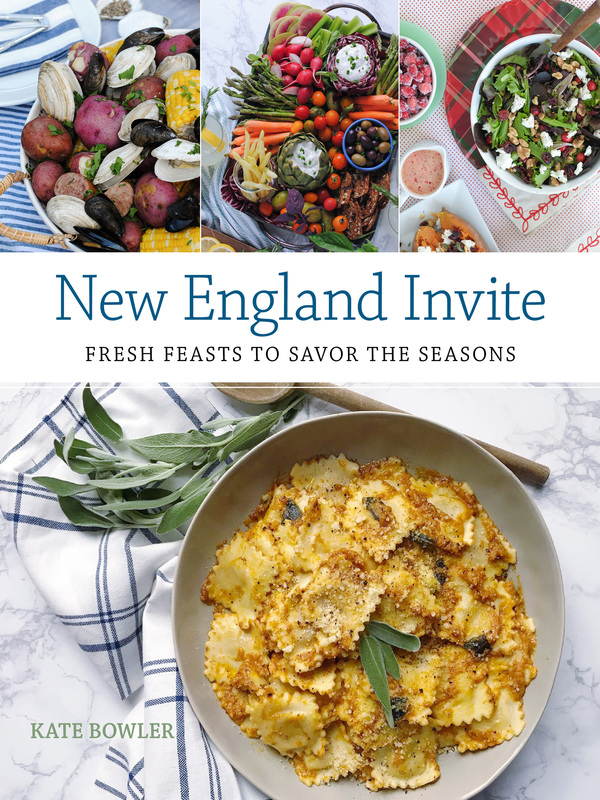 It’s been a big period of change the last two months as we started all of these big eating-based changes, but it’s been so fun to watch Jane explore food – especially as someone who loves food as much as I do! The Download 07.30.17 Blueberry Cobbler Picnic. 2 Responses to "Baby Foodie – Starting on Solids and Making Homemade Baby Food." Omg her little bow! I have these food containers on my baby registry. Glad to hear they’re nice and organized in the fridge! I love them — and they clean up easily too!